Senate candidate Jen Mangrum is seeking to unseat Senate President Pro Tem Phil Berger. Jen Mangrum, a college professor and former elementary school teacher, says she has a July 12 appeal date in her bid to challenge Senate President Pro Tem Phil Berger this fall. Mangrum, a Democrat, is seeking to remain a candidate in Senate District 30. The seat’s currently held by Berger, a nine-term lawyer and Republican from Rockingham County who’s one of the most powerful state lawmakers in North Carolina. Mangrum said her attorney received confirmation Thursday on the July 12 hearing before the State Board of Elections & Ethics Enforcement. 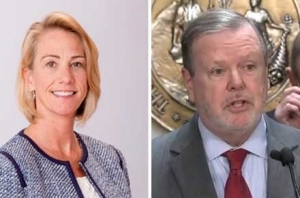 A Rockingham Republican challenged Mangrum’s residency this year after she moved from her Greensboro home into a Reidsville residence before the filing deadline. Court-ordered redistricting last summer prompted new legislative lines that excluded the former Greensboro resident from Berger’s district. Despite her 2018 move within the new district, a local elections panel voted on party lines in May to rule that Mangrum was an ineligible candidate. That panel’s finding was mired in accusations of partisanship and sexism by Mangrum and her supporters. Mangrum has said that’s she’s confident the state elections board will decide in her favor, but she says the challenge has cost her time and money this year. As Policy Watch reported this month, it would seem that Mangrum has a chance against Berger, who ran unopposed in 2016. [At] least one March poll from left-leaning Public Policy Polling suggested the Democratic candidate has a chance against the powerful Republican, who did not face a Democratic opponent in the 2016 election. According to that poll, which was evenly split between Republicans and Democrats in Senate District 30, Berger held a 48-32 percent advantage. However, of that polling group—which voted overwhelmingly for President Donald Trump in 2016—20 percent said they weren’t sure who they’d vote for between Mangrum and Berger. A separate question, which asked respondents whether they would pick Berger or “someone new,” tilted the opposite direction, with 49 percent saying they would support the new candidate compared to 37 percent for Berger. Thirteen percent said they weren’t sure. Government watchdog complaint: Did a state senator and a Superior Court judge break campaign finance laws?